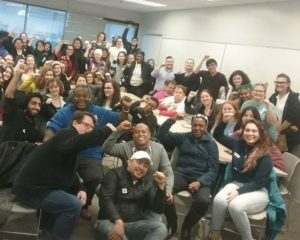 Two weeks ago, on November 5th, Lesley University’s dining workers voted to sign a new contract between their union and Bon Appetit Management Company, securing a minimum annual salary of $35,000 for each of the dining workers at Lesley. The new contract provides better policies on vacation and sick time, as well as increased access to affordable healthcare. Many colleges in the Boston Area have had to raise pay to a living wage, due to the pressure from students and workers acting together; for example, Northeastern University’s workers had to set a date for a strike in order for their University to act. Harvard’s workers had to take it to a strike too, and keep striking for over 2 weeks before their wages were raised. I spoke to several dining hall workers this week, including Radames Moran and Olivia Smulyan. They explained the importance of student activism on this subject. Olivia Smulyan said it was thanks to the support of the students that they won the new contract so quickly. This year at Lesley, workers communicated through the Union, requesting both a raise and better policies on vacation and sick time. The school responded with a new contract that would only offer a 35 cent per hour raise each year for three years. Such a response was not acceptable, and from that moment the union realized they would have to organize if they wanted fair pay and additional sick time. The Lesley Dining Hall workers have been unionized since 2014 (working with Local 26, a union which organizes and protects workers in the gaming, hospitality, food service, and airline industries). Lesley workers are hired by Bon Appetit Management Company, which provides dining services to many colleges in the US. The colleges who contract with Bon Appetit, and not the company Bon Appetit itself, are the determining parties responsible for deciding the wages of the employees at the college dinning halls. The coalition that was formed is called the Lynx Alliance for Workers and Students; and it can be followed on Facebook for future updates. The coalition is currently working on a new campaign for subsidized MBTA passes. Thank you for reporting on this and so happy they were respected! As a Lesley Staff member, I didn’t know this was even happening.